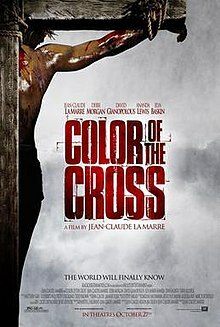 A film written and directed by Jean Claude LaMarre who also portrays this interpretation of a socially colored black Jesus Christ and released in 2005, Color of the Cross proposes that the crucifixion of Jesus Christ was racially motivated, a hate crime to employ a twenty- first century lens (which is the problem with this new narrative). This “Jesus” is described as a “dark- skinned Nazarene” whose Messianic identity is questioned because of the social construct of race. But, even if I suspended disbelief and ignored the continued use of unfounded and irreverent commentary poorly justified by a weak racial conspiracy theory and inspired by the historical mistreatment of African and African Americans, I cannot excuse the changing of the story, His story. This is another gospel with a knife fight at the passover meal and a “Jesus” who says to the disciples who could not watch with him while he prayed in the Garden of Gethsemane, “Excuses. All I ever hear is excuses. Don’t you think that I am tired?” Not only were sacred Scriptures used out of context and out of chronological order but “verses” were added that suggested another reason for the life, ministry and death of Christ. He did not come into the world to save sinners– at least not in Color of the Cross (I Timothy 1.15). No, the story of Jesus Christ is subjected to the American story of race; it serves its purposes. The story of our precious Lord, Jesus Christ is not about the “color of the cross” or the social markers of a world he came to save. If death had no power over him and he, in fact, “made captivity itself captive,” how could he then be a prisoner of race, which did not exist during the time of Jesus by the way (Ephesians 4.7)? And “since, therefore, the children share flesh and blood, he himself likewise shared the same things, so that through death he might destroy the one who has the power of death, that is the devil and free those who all their lives were held in slavery by the fear of death. For it is clear that he did not come to help angels but the descendents of Abraham. Therefore he had to become like his brothers and sisters in every respec, so that he might be a merciful and faithful high priest in the service of God, to make a sacrifice of atonement for the sins of the people” (Hebrews 4.14-17, NRSV). He came into the world in the form of human for this purpose alone. I would hope that Christian believers would not allow 300 years of a racialized history to distort more than 2,000 years of resurrection history. Color of the Cross has misrepresented His message and only its faith in race is in vain.